The Cincinnati Reds first baseman is one game away from matchng the mark of reaching base at least twice in 21 consecutive games. It's an understatement to say that Joey Votto gets on base a lot. In his 10th full major league season, the Reds star first baseman is on track to lead the National League in on-base percentage for the sixth time. His career .427 OBP ranks 10th all time among players with at least 5,000 plate appearances. And now, he's become so proficient at getting on base that he's on the verge of history. That's three Hall of Famers (Williams, Gehrig and Hornsby), two who would be if not for various extracurricular concerns (Rose and Bonds), one very good player during the best season of his career (Finley) and one obscurity: Evans, a solid player for the Cardinals from 1909 to '13 who emerged as a star with the Brooklyn Tip Tops of the short-lived Federal League. Not included above is an 18-game streak of the A's Jason Giambi which bridged the 2000 and '01 seasons. Williams, the only player on the list multiple times, is the all-time OBP leader at .482, with Gehrig (.447), Bonds (.444) and Hornsby (.434) fourth, fifth and sixth, respectively. Votto's current streak began with a two-hit game against the Yankees on July 26, the first of seven such games amid a 17-game hitting streak, which itself matched a streak from last summer as the longest of his career. The hitting streak ended with an 0-for-3 against the Brewers on Aug. 13, but his two walks in that game kept the on-base streak alive. It includes a two-PA game on Aug. 6 in which he hit a three-run homer off Adam Wainwright in the first inning (his 250th career homer) and walked in the second but was pulled in the fifth inning after the Cardinals built a 13-3 lead. Even that game has fit within the general pattern of the streak, for only on Aug. 1 against the Pirates did Votto come to bat in the late innings needing to reach base a second time (he singled off Wade LeBlanc in the eighth in that one). In all, he’s batting .435/.611/.742 over that 20-game span, boosting his season line to .316/.448/.600 with a 171 OPS+ (first in the league) and 5.6 WAR (second). Votto's already-strong season—which also includes 31 homers (currently third in the NL) and 98 walks (first)—helped him make the NL All-Star team in July, the fifth time he's done so but the first time since 2013. Perhaps not coincidentally, that was the last time Cincinnati finished above .500; his continually strong work has largely escaped notice since then, though a 2014 season abbreviated by knee and quad injuries didn't help. With the Reds currently immersed in a rebuilding program, Votto's 2017 showing has largely flown beneath the radar, because who but the most ardent diehard can bear watching a team that’s allowing an MLB-worst 5.49 runs per game? Even so, there's something else at work. Baseball fans revere hitting streaks, none more than Joe DiMaggio's record-setting 56-gamer from 1941, which is generally considered one of the most unbreakable records in any sport. But ask a casual fan what the record is for an on-base streak and you'll likely be greeted with a blank stare. It's 84 games, by Williams from July 1 to Sept. 27, 1949, with DiMaggio's 74-gamer from May 14 to Aug. 2, 1941 the runner-up; that included the aforementioned hitting streak that lasted from May 15 to July 16. Williams also had a wraparound 74-game streak from July 19, 1941 (recall, that was the year he hit .406, the last time MLB has seen a .400 season) through April 18, 1942. The post-World War II record for consecutive games reaching base is held by . . . wait for it . . . Orlando Cabrera, who pieced together a 63-gamer with the Angels from April 25 through July 6, 2006. Cabrera was hardly an on-base king, finishing that season with a .335 on-base percentage in a league where .339 was average. In terms of postwar single-season streaks, he surpassed 58-gamers by Bonds (2003) and Duke Snider (1954). Votto's longest streak with at least one time reaching base is 48 games, set in late 2015; that's tied for the 54th longest of the Play Index era (1913 onward) and shared with Rose (1978, starting two days before he launched his NL-record 44-game hitting streak) as the franchise record. He still has a long way to go to match his season-high 27-game on-base streak, which ran from April 24 through May 24 of this year. 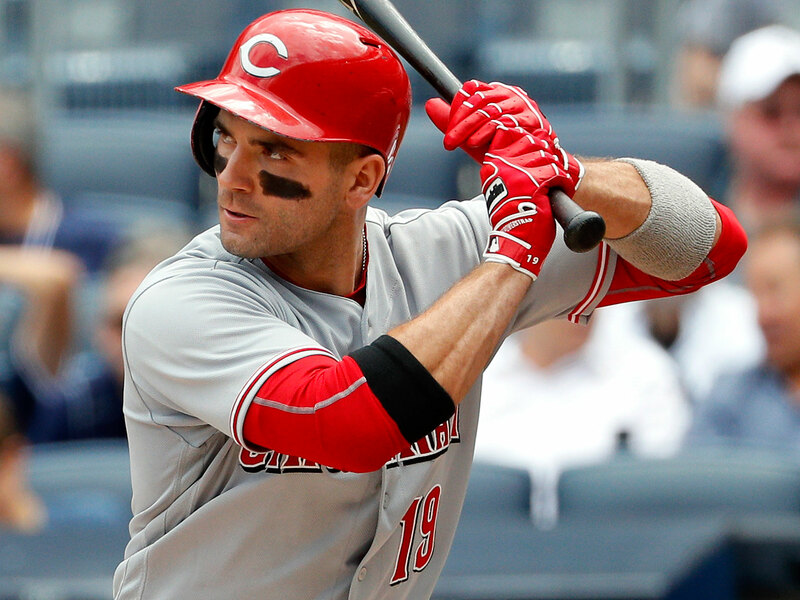 Having rebounded from his 2014 injuries, Votto is building a case for Cooperstown, albeit quietly. His remarkable discipline as a hitter has enabled him to lead the NL in walks five times prior to this year, but it has also drawn him endless criticism in some quarters of Cincinnati, including the team's broadcasting booth. His score of 79 on the Bill James Hall of Fame Monitor, which dishes out credit for things like seasons or careers with batting averages above .300, leagues led in key stats, and common statistical plateaus (200 hits, 100 RBI, 30 homers)—all of which generally track with voter support — suggests he faces an uphill battle. A score of 100 indicates a likely Hall of Famer, and a 130 a "virtual cinch." Votto has never reached 200 hits, and has just two 100-RBI seasons (2010 and '11) and two 30-homer ones (2010 and this year). That said, Votto’s case for Cooperstown looks much stronger in light of advanced statistics. Though he's never led the league in WAR, he's ranked among the top five five times, including this year, with an eighth-place finish as well. His 53.0 career WAR ranks 28th among first basemen, below 16 of the 20 in the Hall of Fame, but obviously, he's not done yet; another 5.0 WAR would push him past four Hall of Famers to 21st, and with a contract that's guaranteed through 2023, he should be expected to climb higher than that. Already, his seven-year peak total of 43.7 WAR is above that of the average Hall first baseman (42.7), and that should climb higher as well. His current 5.6 WAR season rates as the sixth-best of his career, but he's on pace to match his personal best of 7.6, set in 2015. So while his 48.3 JAWS ranks "only" 22nd among first basemen, his current pace plus a five-win season next year would rocket his line to 60.6/46.5/53.6, tied with Hall of Famer Eddie Murray for 15th all-time and within one point of the Hall standard for first basemen. Even another 10 WAR over the remaining five years of his contract would push him into the position's top 10. All of which is to say that despite the Reds' current woes, it's worth keeping an eye on Votto, not only as he faces the Cubs on Wednesday night with a chance to match Williams’ feat but for the remainder of this year in general. It's not often you get to see a future Hall of Famer still at his peak.